Last week we were invited to the launch of the London Marriott County Hall’s new Silver Lining Service, enlisting a Meteorologist the hotel now offers a weather reactive service at their 5* hotel by Westminster bridge. Marriott have enlisted the help of Senior Meteorologist Kirsty McCabe, who currently presents on Sky News. Kirsty will be presiding over local weather matters, helping hotel guests get the most out of their stay— come rain or shine. With Kirsty’s help the hotel has launched its Silver Lining Package – a weather reactive service for guests staying in their 12 premier suites, meaning that the rooms will respond, in real time, to the conditions outside. A little cloudy? A light therapy lamp will be on the bedside table. Things turn a bit windy? A hair stylist will be on hand to make sure you look your best for the evening ahead. A downpour? Wellies and raincoats will be at the suite door. Sun’s blazing? Find a selection of luxury skincare already in the bathroom. So you get the idea, you don’t have to worry about the weather the hotel anticipates your needs to help you enjoy your stay in London no matter what the weather. And as a Londoner myself I know full well that our weather is far from predictable so good to have the professionals on board to help out! So while we were there Marriott kindly let us stay in one of their rooms for the night so we can experience a bit of what the hotel has to offer and the Silver Lining Package. Last Monday was a scorcher so the room should reflect that right? 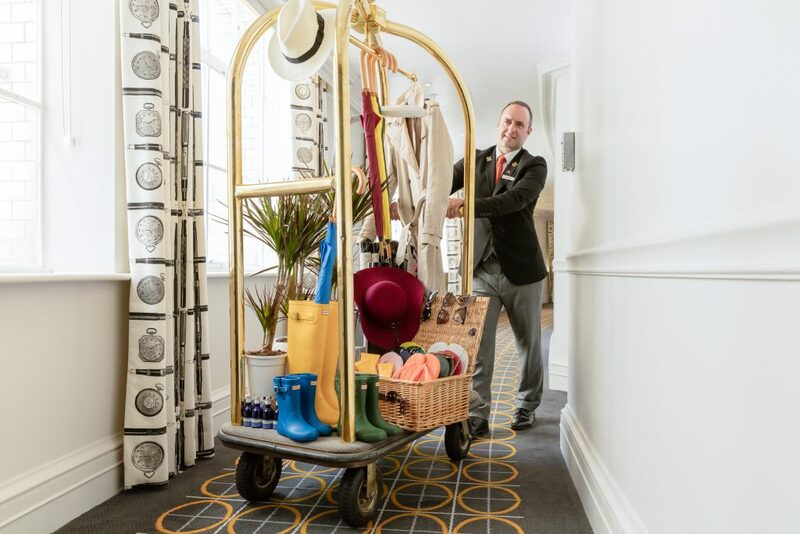 Well when we entered the room we were greeted with a weather care package including some sun cream and moisturiser for the sunny day ahead oh and an umbrella because its London and you never know right? 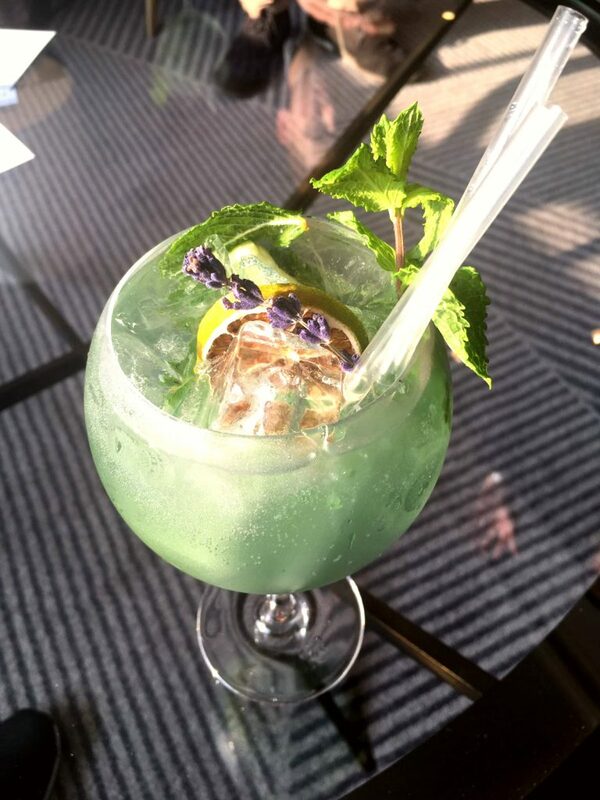 To top it off ice, gin and tonic was left on the desk – a perfect sunny day drink and a lovely greeting as we entered the room. 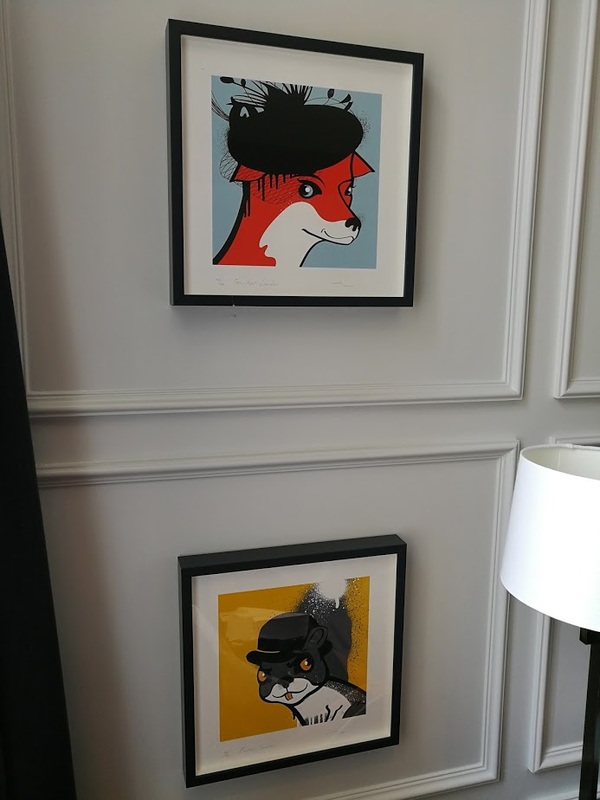 The whole hotel was recently refurbished late last year and they have really gone to town on instilling the London theme throughout the room and the hotel itself. From the artwork on the walls subtly themed on areas of London to the wallpaper in the room featuring a lovely map of the whole city. Even the TV cabinet had the shape of the River Thames running through it. A lot of effort has been made to make your stay special and I’m sure tourists would love these little touches. 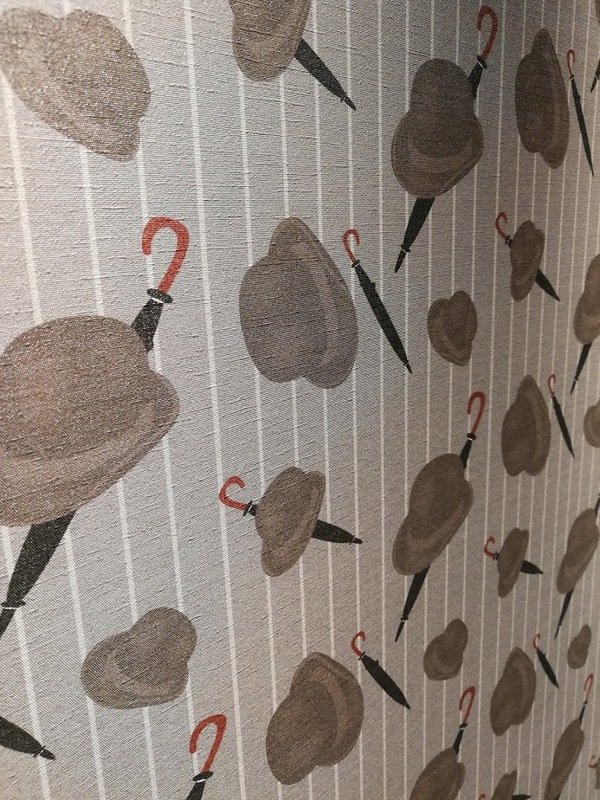 Even as a Londoner I couldn’t help but smile – even the hallway had bowler hat wallpaper! 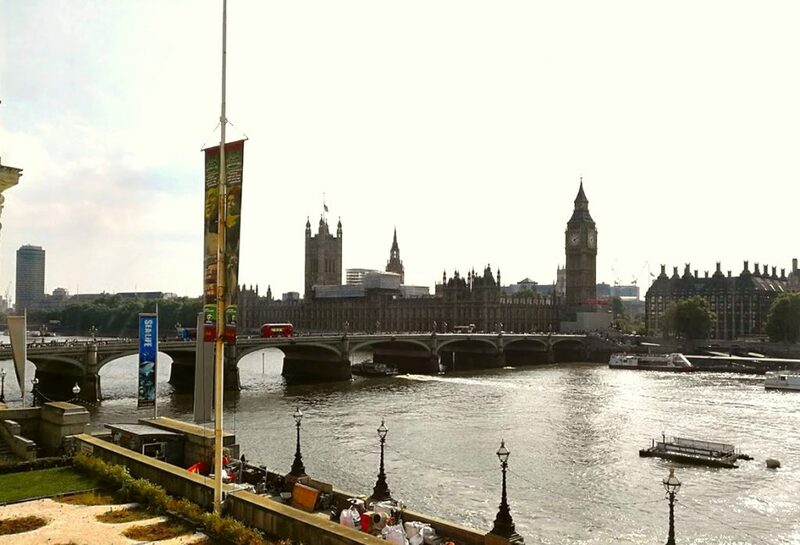 The Hotel itself is located just by Westminster Bridge so as you can imagine the views from the window were pretty spectacular. I’m not sure my photo does it justice but waking up to Big Ben outside your window is pretty special indeed. View from our room, amazing! One thing we noticed was the friendliness of the staff and I mean all the staff. Everything happens with a smile and nothing is too much trouble. Check out this video of the barmen – I ordered an Old Fashioned and the barman infused the drink with smoke. I have never seen this before and drunk many Old Fashioneds in many a bar and hotel, I was really impressed. We went through the menu and also had the most amazing gin and tonic and my girlfriend loved one called the Mary Poppins. It tasted like chocolate and that was good enough for her. After a few drinks we decided to head back to the room and order some room service – when you have an amazing room and view like that, why go out for dinner? 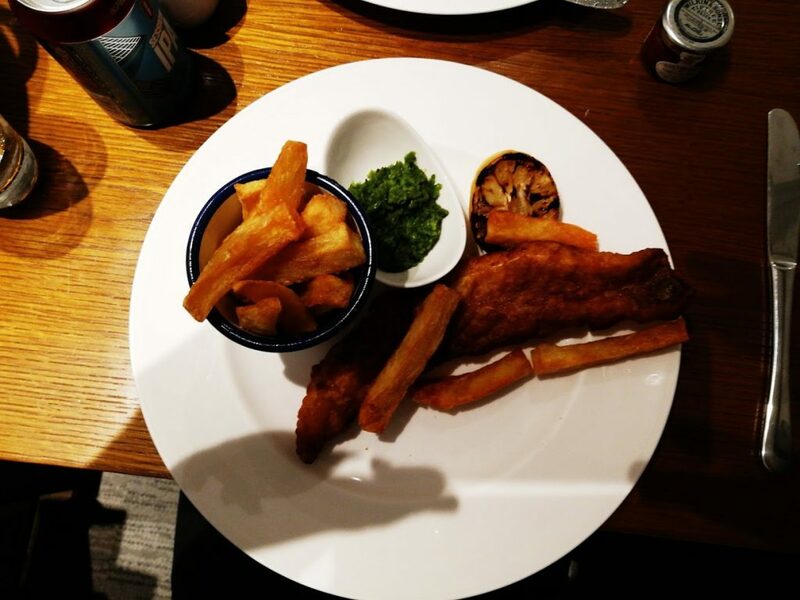 The room service comes from the hotels restaurant Gillray’s Steakhouse so the obvious move for me was to try the steak which was amazing, my girlfriend went for the fish and chips which was really good too but I could see a bit of steak envy in her eyes. Staying in our Big Ben view room we also had access to the newly renovated M-Club Lounge – a bit like a airport lounge in the hotel with snacks, drinks and computer access along with another stunning view of Westminster and Big Ben, pretty cool to say the least. We had a lovely stay at the Mariott County Hall and felt thoroughly looked after throughout. 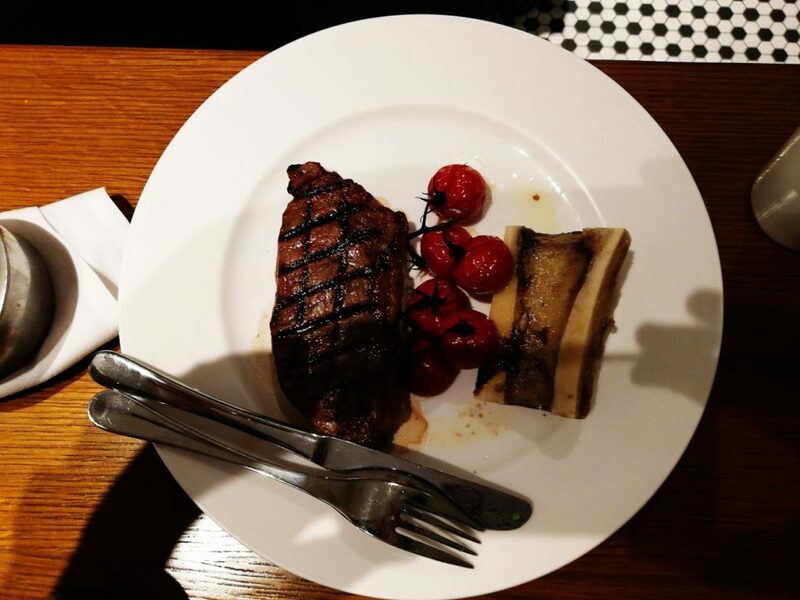 Consider us impressed.